As I mentioned previously, the Mixed Reality "virus" has caught me recently and I spend a good portion of my Mozilla contribution time with presenting and writing demos for WebVR/XR nowadays. The prime driver for writing my first such demo was that I wanted to do something meaningful with A-Frame. Previously, I had only played around with the Hello WebVR example and some small alterations around the basic elements seen in that one, which is also pretty much what I taught to others in the WebVR workshops I held in Vienna last year. Now, it was time to go beyond that, and as I had recently bought a HTC Vive, I wanted something where the controllers could be used - but still something that would fall back nicely and be usable in 2D mode on a desktop browser or even mobile screens. While I was thinking about what I could work on in that area, another long-standing thought crossed my mind: How feasible is it to render OpenStreetMap (OSM) data in 3D using WebVR and A-Frame? I decided to try and find out. First, I built on my knowledge from Lantea Maps and the fact that I had a tile cache server set up for that, and created a layer of a certain set of tiles on the ground to for the base. That brought me to a number of issue to think about and make decisions on: First, should I respect the curvature of the earth, possibly put the tiles and the viewer on a certain place on a virtual globe? Should I respect the terrain, especially the elevation of different points on the map? Also, as the VR scene relates to real-world sizes of objects, how large is a map tile actually in reality? After a lot of thinking, I decided that this would be a simple demo so I would assume the earth is flat - both in terms of curvature or "the globe" and terrain, and the viewer would start off at coordinates 0/0/0 with x and z coordinates being horizontal and y the vertical component, as usual in A-Frame scenes. For the tile size, I found that with OpenStreetMap using Mercator projection, the tiles always stayed squares, with different sizes based on the latitude (and zoom level, but I always use the same high zoom there). In this respect, I still had to take account of the real world being a globe. Once I had those tiles rendering on the ground, I could think about navigation and I added teleport controls, later also movement controls to fly through the scene. With W/A/S/D keys on the desktop (and later the fly controls), it was possible to "fly" underneath the ground, which was awkward, so I wrote a very simple "position-limit" A-Frame control later on, which prohibits that and also is a very nice example for how to build a component, because it's short and easy to understand. But to make the demo really look like a map, it of course needed buildings to be rendered as well. Those are more complex, as even the simpler buildings are "ways" with a variable amount of "nodes", and the more complex ones have holes in their base shape and therefore require a compound (or "relation" in OSM speak) of multiple "ways", for the outer shape and the inner holes. And then, the 2D shape given by those properties needs to be extruded to a certain height to form an actual 3D building. After finding the right Overpass query, I realized it would be best to create my own "building" geometry in A-Frame, which would get the inner and outer paths as well as the height as parameters. In the code for that, I used the THREE.js library underlying A-Frame to create a shape (potentially with holes), extrude it to the right height and rotate it to actually stand on the ground. Then I used code similar to what I had for trees to actually create A-Frame entities that had that custom geometry. For the height, I would use the explicit tags in the OSM database, estimate from its levels/floors if given or else fall back to a default. And I would even respect the color of the building if there was a tag specifying it. With that in place, I had a pretty nice demo that uses data directly from OpenStreetMap to render Virtual Reality scenes that could be viewed in the desktop or mobile browser, or even in a full VR headset! It's available under the name of "VR Map" at vrmap.kairo.at, and of course the source code can also be expected, copied and forked on GitHub. Again, this is intended as a demo, not a full-featured product, and e.g. does at this time only render an area of a defined size and does not include any code to load additional scenery as you are moving around. Also, it does not support "building parts", which are the way to specify in OSM that a different pieces of a building have e.g. different heights or colors. It could also be extended to actually render models of the buildings when they exist and are referred in the database (so e.g. the Eiffel Tower would look less weird when going to the Paris preset). There are a lot of things that still can be done to improve on this demo for sure, but as it stands, it's a pretty simple piece of code that shows the power of both A-Frame and the OpenStreetMap data, and that's what I set out to do, after all. My plan is to take this to multiple meetups and conferences to promote both underlying projects and get people inspired to think about what they can do with those ideas. Please let me know if you know of a good event where I can present this work. The first of those presentations happened a at the ViennaJS May Meetup, see the slides and video. I'm also in an email conversation with another OSM contributor who is using this demo as a base for some of his work, e.g. on rendering building models in 3D and VR and allowing people to correct their position data. I hope that this demo spawns more ideas of what people can do with this toolset, and I'll also be looking into more demos that will probably move into different directions. After my last post on Lantea Maps (my web app to record GPS tracks), I started working on some improvements to its code. First, I created a new backend for storing GPS tracks on my servers and integrated it into the web app. You need to log in via my own OAuth2 server, and then you can upload tracks fairly seamlessly and nicely. The UI for uploading is now also fully integrated into the track "drawer" which should make uploading tracks a smoother experience than previously. And as a helpful feature for people who use Lantea Maps on multiple devices, a device name can be configured via the settings "drawer". The saved tracks are listed in the new library view (also accessible for the track "drawer" when logged in) and linked to a GPX file to download download - that way the recorded and uploaded tracks can be accessed from a different device and downloaded to there. The library UI has a lot of potential for improvement but this first version has been working decently for me for a while now in testing. In addition, the first piece of new PWA (Progressive Web Apps) technology has been integrated: Due to the W3C Manifest, you can now add Lantea Maps to your home screen from browsers like Firefox for Android. Even more, I optimized the code drawing the GPS tracks so that off-screen segments aren't drawn, even though I'm unsure how to measure drawing and panning speed, so I can't put actual numbers behind what that work may have helped or not - but I hope it improved performance when large tracks are loaded. To round up all the work, I added a welcome and an update information screen to be able to tell people both how to initially use the app and what changed on updates. This is a spare time project so I'm doing updates very irregularly but I'm using the app myself almost daily so it should continue to be maintained in the future as time and motivation allow. In the last weeks, I spent some time on developer events, which I always embrace a lot because the "hallway tracks" are a constant great flow of interesting information and discussions - and of course the official talks are often quite interesting as well! First up was the Mozilla Hacking Day in Berlin on Saturday, April 26. I met Arpad Borsos, fellow Mozillian from Vienna, already at Vienna airport on Friday, as we incidentally were hopping over from the Austrian to the German capital in the same plane. Later in Berlin, we met more Mozillians at the hotel and went out for dinner together. On Sunday, I also was able to squeeze in some sightseeing and photo-taking, marching through Berlin for ~3.5h before returning to the airport. And last week, May 8-10, it was time for the yearly Linuxwochen conference in Vienna. As we do not have an organized group of Mozillians here, we didn't have a Mozilla booth, but I usually share the OpenStreetMap booth (that's why you'll spot that in the pictures), as I'm pretty active in the local community there, and just run around with Mozilla T-shirts and talk about Mozilla stuff in addition to OSM things. I also had submitted talks about Firefox OS and the Makey Makey, but as you'll see in my speaker profile, I was additionally "coerced" into a privacy and security panel discussion last-minute as well. I was put there as more or less a representative of Mozilla and more in general those doing end-user software, and of course also tried to drum home a few points of how Mozilla strongly works for respecting user privacy but also pointed out how it is an interesting field that sometimes has tradeoffs with enabling features that people out there really want, and finding a balance can be hard. The Firefox OS talk was quite appreciated by people attending, and we had quite a few good questions asked there as well, and interest from people afterwards to actually see and try my FxOS phones - I remember how some hard a hard time believing how well the ZTE Open worked with just 256MB of RAM and an all-web UI. In the "hallway track", I did get a lot of questions about Mozilla on all three days, given my T-shirts clearly pointed out my affiliation with the project. Some of those were Firefox OS, mostly about strategy and availability, where I had to explain a few times how we target features phone converts in emerging markets for now. A number of the concerns and questions were around Australis, with quite a few of the very technical folks there not liking how we messed up their customizations and preferences, including tops-on-bottom or the add-ons bar, or how esp. our tabs looked "just like Chrome" now, but I even heard one or two comments on how awesome the new design was. Some of those I could ease with explanation and pointing to the Classic Theme Restorer add-on, but some of them are just unhappy (and it's not helpful that the very helpful Tour does not run when NoScript is installed and active). And then there were questions about our finances (the "Google dependency" issue) and about the fact that new Sync clashes with Master Password (which also protects casual "friends" from reading through passwords in your password manager), among others. Overall, a lot of talk about Mozilla, and I hope I could make most of those people feel better about us than before, wherever they stood then. Both events cost me a lot of sleep and energy right there, but feel like they were worth the investment for sure, and the meeting and talking to people also gives me energy of a different form. I blogged about Lantea Maps 18 months ago. As its marketplace listing describes, the app's purpose is displaying maps as well as recording and displaying GPS tracks. Still, performance of the map canvas was not good - on phones (esp. the small 320x480 screens like the ZTE Open), where you only have a handful of 256x256 map tiles to draw, panning was slightly chunky, but on larger screens, like my Android tablet or even my pretty fast desktop, it ranged from bad to awful (like, noticeably waiting from any movement until you saw any drawing of a move map). Also, as it takes until images are loaded (cached from IndexedDB or out from the web) and that's all called asynchronously, the positions the images ended up being drawn often weren't completely correct any more at the time of drawing them. I tried some optimizations with actually grepping the pixels from the canvas, setting them in the new positions and only actually redrawing the images on the borders, but that only helped slightly on small screens while making large ones even worse in performance. Given what I read and heard about how today's graphics chips and pipelines work, I figured that the problem was with the drawImage() calls to draw the tiles to the canvas as well as the getImageData()/putImageData() calls to move the pixels in the optimizations. All those copy image data between JS and graphics memory, which is slow, and doing it a lot doesn't really fit well with how graphics stacks work nowadays. The only way I heard that should improve that a lot would be to switch from 2D canvas to WebGL (or go to the image-based tile maps that many others are using, but that wouldn't be as much fun). I don't remember all sources for that, but just did get another pointer to a Mozilla Hacks post that explains some of it. And as Google also seems to being moving their Maps site to WebGL (from image-based tiles, mind you), it can't be a really wrong move. So, I set out to try and learn the pieces of WebGL I needed for this app. You'd guess that Mozilla, who invented that API together with Khronos, would have ample docs on it, but the WebGL MDN page does only have one tutorial for an animated 3D cube and a list of external links. I meanwhile have filed a bug on a WebGL reference so may improve this further in the future, but I started off first trying with the tutorial that MDN has. I didn't get a lot to work there except some basics, and a lot of the commands in there were not very well explained, but the html5rocks tutorial helped me to get things into a better shape, and some amount of trying around and the MSDN WebGL reference helped to understand more and get things actually right. One thing that was pretty useful there as well was separating the determination of what tiles should be visible and loading them into textures from the actual drawing of the textures to the canvas. By doing the drawing itself on requestAnimationFrame and this being the only thing done when we pan as long as I have all tiles loaded into textures, I save work and should improve performance. As you can see from the images, the 2D canvas and WebGL versions of Lantea Maps do not look different - but then, that was not intended, as the map is the map after all. Right now, you can actually test both versions, though: I have not moved the WebGL to production yet, so lantea.kairo.at still uses 2D canvas, while the staging version lantea-dev.kairo.at already is WebGL. You'll notice that panning the map is way more fluid in the new version and the tile distortions that could happen with delayed loading in the old one do not happen. I still wonder though why it sometimes happens that you have to wait very long for tiles to load, esp. after zooming. I still need to figure that out at some point, but things render after waiting, so I found it OK for now. Also, I found the WebGL app to work fine on Firefox desktop (Linux), Firefox for Android, as well as Firefox OS (1.1, 1.2, and 1.5/Nightly). So, I'm happy I did manage the conversion and learn some WebGL, though there's still a lot to be done. And as always, the code to Lantea Maps is available in my public git as well as GitHub if you want to learn or help. While we at Mozilla know you can do a lot of good things in JS these days - after all, we're even launching our own phone OS building fully on HTML+JS, and we have been using more and more JS code to power key functionality in our browsers and other products over the years - it's great to see that complex things like editing maps can be done fully in JS and available for all platforms now, while previously it took proprietary and availability-limited technologies like Flash or Java to do the same thing. 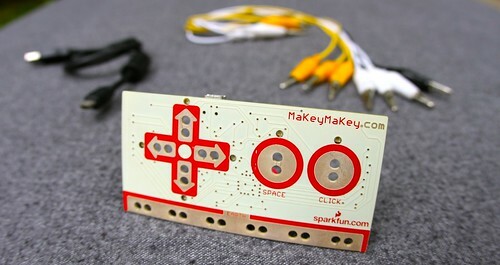 I think I probably became aware of the MaKey MaKey when Chris Heilmann blogged about it, but I might have heard about it even before. I surely saw it when Chris had his WebRTC photo booth running with it at MozFest 2012 in London. When I ran across it again on ThinkGeek, I put it on my wish list - and finally ordered one this month. Now, after I had wrapped up this week of work, I finally found some time to play with it, and an interesting and very geeky Friday night ensued. Here's a bit more about that - and about Saturday, and further plans/ideas. So, for one thing, I wanted to use this device with actual Open Web stuff, and not with Flash or other proprietary software. After all, this is Open Hardware (yay!) and I'm entirely entrenched in Open Source / Free Software, from using Linux on desktop, laptop and server, via working for Mozilla/Firefox, to doing some web apps under the MPL2 license in my free time. So, given the latter, I decided it would be nice if I could navigate the OSM world with my Lantea Maps app/site (source) using the MaKey Makey. For that, I had to put some keyboard accessibility into Lantea Maps itself, which is a good idea for accessibility, among other things, anyhow. So I did that, looking at Chris' testy-testy and MDN to find out how to achieve that best. I ended up implementing methods to move the map with the arrow keys, hooked up zoom in/out to +/- keys as well as w/s (the latter are supported by MaKey MaKey out of the box), and then also created direct shortcuts to certain zoom levels with the 0-9 numeric keys (not supported by MaKey Makey, but convenient for keyboard users). Note that the back side as well as the right rim of the pad is covered with a single sheet of tinfoil that makes the earth connection quite naturally when you hold the pad in your hands. And then I was ready to play some BananaBread, now with both the awesomeness of running a 3D first person shooter seamlessly in the browser AND using a special game pad for playing! If you're interested, not only are those pictures all linked to the gallery where you can go up to "big" versions of those, there's a few more steps of building visible in this photo gallery. 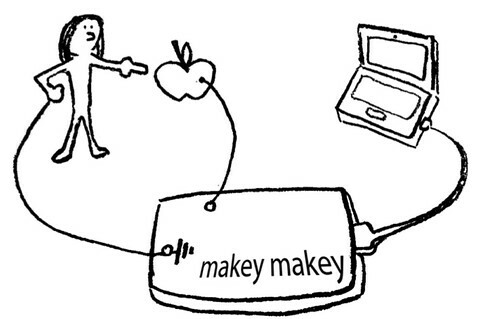 Given all that and the fact that Linuxwochen Wien in the first days of May has an additional focus on Open Hardware this year, I decided to hand in a proposal for a talk on MaKey MaKey there. I intend to show off those pads as well as Chris' photo booth and any other MaKey MaKey experiments that I can fit, preferably ones that run as web pages/apps (let me know if there are any nice ones). I'm thinking that it could be nice to have an app that shows you on screen in a web site which kind of fruit/item you touched (configurable with key <-> item entries), and I'd love a web (not Flash) piano and/or drumset (using ogg or even opus files with HTML5 audio!) app to present, maybe I can hack something up if there's nothing around. If this has caught your interest, it's easy to get your own MaKey MaKey, and if you're in or around Vienna in the first days of May, I'd be happy to meet you at my talk (there will be a Firefox OS App workshop as well, probably!) - oh, and if you have any nice, open web apps/pages that show off this device, let me know! Lantea Maps - Contributions Welcome! I just split my Lantea Maps web app out of my main git repo and into its own small one, one main reason being that I can place it on GitHub as well. This is not meaning that I suddenly love the GitHub site, but having the repo there lowers the entry barrier for potential contributors and I'd be very happy to have people help me with this app. Lantea Maps is a prototype web app to display maps and record (GPS) tracks, and I found it works pretty well with Firefox OS, actually. It's one of the apps I keep installing on my test device for that system, of course from its Mozilla Marketplace listing. The app is based on a canvas that displays a map (from OpenStreetMap, multiple styles can be selected) and on which the recorded GPS tracks are displayed. The start of the app is there and working, but it could need quite some improvement - like making zoom switches and probably map panning smoother by using some canvas magic, supporting pinch gestures, caching tiles not just during a session but also across sessions (using IndexedDB), and more. As mentioned on the original Lantea idea wiki page, there's a quite nice app for the Nokia N900 called Mappero that is a good source for feature and UI ideas, for me it's one the the best apps in that space and I'd love to have something similar to it as a web app - which is basically why I started Lantea at all. That said, I'm open for all kinds of ideas for it - and even more, to patches and pull requests! The "State of the Map - Europe" conference in Vienna was a full success, 200 members of the OpenStreetMap community had inspiring talks and discussions here and everyone had a lot of fun and inspiration. I also couldn't be more proud of acting as a Mozilla representative on the conference and I had a lot of interesting discussions in that role, including people being thrilled that Mozilla sponsors such and event "just" to move openness and innovation on the web forward. But that's not what this post is about, I actually want to highlight one thing I heard about in a talk there. Martin Christen from Switzerland had a really great talk on the OpenWebGlobe SDK today, and I was completely thrilled to see this as it does a lot of things I had wished for in the days before. When there I dreamed about "something similar in spirit to Google Earth, but completely in the browser", I didn't know yet that the University of Applied Sciences Northwestern Switzerland was already working on the basis for all that and had demos pointing in that direction. Doesn't that look cool? Remember that this is actually running as a 3D environment in the browser - and directly in HTML, not needing any plugin! Oh, and all its code is open source software (the web viewer is available via github under MIT license, there's a download for the SDK, I didn't check its license but I think it's MIT as well)! In any case, check out the work of his team, it's absolutely awesome. If you don't believe me yet, there's even an alpha preview you can test yourself right now! And a video of his talk will become available very soon (watch out for a camera icon in the box for his talk on the SotM-EU schedule), if you're interested in what he presented in Vienna. I've recently enlisted into the Mozilla Reps ("ReMo") program, mainly to procure sponsoring by Mozilla for the 1st European OpenStreetMap conference, known as "State of the Map - Europe" (SotM-EU). I'll be the sole representative this weekend of Mozilla being one of the major sponsors of this event, and I'm also helping somewhat with organizational matters, as my colleagues from the "OpenStreetMap Austria" association are the organizers of the conference. It will be an interesting role to represent Mozilla, and I'm very proud of that, as this gives me a chance to talk a lot about the one thing in Mozilla I'm most passionate about: our mission. Supporting a conference on an open, innovative project that creates opportunities for everyone on the web and beyond goes to the heart of what Mozilla is, and I couldn't be happier about being present there. Things start off with a public pre-event discussion tomorrow evening and the conference itself is taking place from Friday to Sunday, so don't expect to see me online a lot in the next few days, I'm exploring this strange place called "real life" with other geeks - and probably mapping it out some more.